There is one thing that every food stall in every carnival or fair must provide: fried food. Once this understanding has been understood, the next step is to decide what to fry. Naturally, potatoes come to mind for having a good ratio of deliciousness to cheapness. But still, one needs to put a spin on things to stand out. The 10w Stainless Steel Automatic Food Slicer Cutter Twister Machine is exactly what the carny ordered. 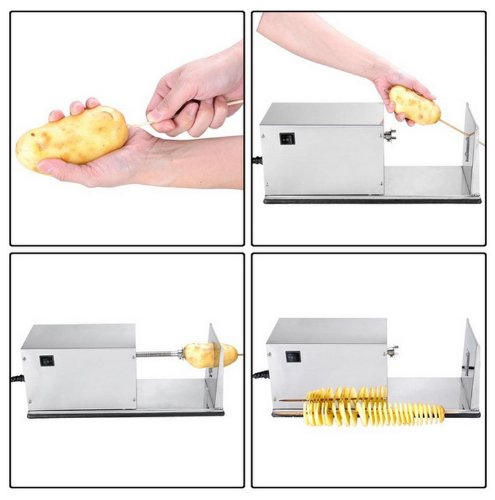 For the low, low price of $169.99 you too can be making tornado potatoes from the comfort of your very own food stall. Or perhaps even the home, it being time for back to school and all — which in that case this little rotary cutter is a double bonus! Use during the school year might not provide the healthiest options (oh, just put an apple in there or something), but when summer rolls around next year, the family will be all set to rake it in from the rubes. PPS: The last time BTKS featured a similar rotary slicer it had a price of over $500!